About a year ago, I spent quality time with the House of Marley Zion in-ear headphones which left a good impression thanks to their natural bass. With a price tag twice as large, the Legend enters a market segment which is inhabited by properly heavy hitters. Read on to find out if the headset lives up to the expectations. The House of Marley Legend headphones ship in a great-looking, well-appointed retail package. Made from recycled paper, the box contains a leatherette carrying pouch, four additional sets of ear tips, airplane adapter, and a couple of booklets. In a manner befitting its price tag, the Legend has users covered out of the box as far as additional accessories go. There is nothing missing. The House of Marley Legend can easily contend for the crown of the best-looking in-ear headphones available at the moment. With a chassis machined from a single piece of recyclable aluminum and adorned with sapele wood accents, the headset is a pleasure to look at every single time you pick it up. Use of premium materials in the headset’s construction also results in tactile experience which is as good as the visual one. The headphones feel great when handled. 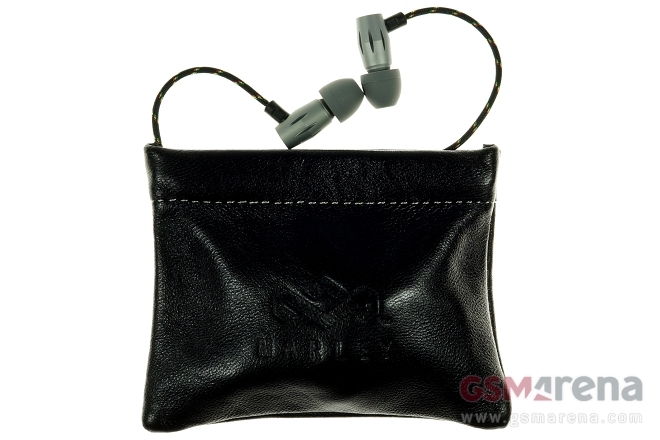 The headphones’ fabric-covered cable, like in the rest of the company’s range, features Jamaican flag color accents, thus further enhancing their visual character. Overall, like I already suggested, the headset deserves nothing but high praise for its appearance. Build quality is in line with the expectations which the Legend’s price tag carries. The headphones are exceptionally well put together. I spent weeks with them as a daily driver and found nothing to frown at as far as quality of their finish goes. The L-shaped 3.5mm connector and the remote control are both made of durable polycarbonate. Both handle abuse with no fuss just like the rest of the headset. Thanks to their small footprint and lightweight aluminum construction, the House of Marley Legend headphones remain comfortable even during hours of continuous use. With five different ear tips available out of the box, everyone should be able to find a comfortable fit. The fabric-covered cable is tangle-free as expected. Also, at 52 inches (about 1.3m) of length, I found it comfortable for casual use. The iOS-friendly remote has three well-spaced buttons and is easy to operate. As expected, only the middle button works on non-iOS devices. House of Marley is coy about the specs of the Legend in-ear headphones. One the product’s webpage, the manufacturer boldly claims that the headset has been engineered and manufactured to reproduce music the way artists originally intended. It takes only a few seconds to realize that the Legend headphones are significantly more capable than the rest of House of Marley’s in-ear range. Unlike its lesser siblings, the Legend produces powerful, yet neutral sound, devoid of heavy bass influence. In short, the headphones behave like accordingly for their price tag. The above doesn’t mean that the House of Marley Legend headphones are not capable from producing deep lows. This time around however, they are accompanied by accomplished mid and high range. Combined, they allow users to enjoy any music style from reggae to opera with equal success. Quality of both incoming and outgoing phone calls is flawless. Superb to look at and handle, and greatly sounding, the House of Marley headphones are everything a high-end in-ear offering should be. The headset is a wonderful alternative for everyone, looking for top notch earbuds, and willing to steer away from the well-established brands on the market. This leads to the matter of the Legend’s suggested $219.99 price tag. It takes the company’s earbuds into a realm inhabited by products from heavy hitters, thus making them a tough sell. However, major online retailers such as Amazon and Walmart offer the headset for as low as $113, thus making it as easy to recommend as it gets.